We specialise in all aspects of divorce and family law, insurance law, civil litigation and mediation. Established in 1992, we have assisted clients in resolving a diverse range of legal matters over the years. 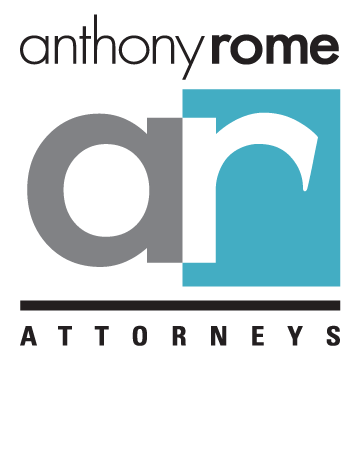 Anthony Rome Attorneys is a dynamic law firm focused on providing unique and cost efficient solutions. Our mission is to simplify delivery of the law and make it more accessible. We also support alternative methods of dispute resolution such as mediation. We believe our strength lies in our size as we are able to provide clients with the expertise of a large law firm while still delivering a hands-on, efficient and personalised service. We have a fresh and effective approach to law. Our offices are conveniently situated on Jan Smuts Avenue in Rosebank, Johannesburg, within the jurisdiction of both the Johannesburg and Randburg courts. We accept instructions both nationally and internationally. Anthony graduated from the University of South Africa in 1989. After his admission as an attorney, he founded Anthony Rome attorneys in 1992. He has extensive experience in most areas of litigation including matrimonial, insurance, commercial and criminal law. He is a keen strategiser and believes in a holistic approach to dispute resolution. His interests outside of law include financial markets and investing, creative writing and sport. Jeanique studied at the University of the Witwatersrand, attaining her LLB in 2005. Jeanique began her legal career as a claims handler for the Road Accident Fund in 2006, leaving the organization in order to pursue her articles. Jeanique joined Anthony Rome Attorneys in 2008 as a candidate attorney and was admitted as an attorney of the High Court in 2010. Jeanique has extensive experience with the assessment of insurance claims and family law matters.